i-Open Focus is a nod from i-Open Technologies to the people who make our organization turn. It’s a way for us to highlight and recognize the people that help make i-Open Technologies what it is. Erik DiGuistini playing with his drone while exploring an old castle in Croatia. Meet Erik DiGuistini, the Marketing & Communications Assistant at our HQ located in Abbotsford, BC. What is your role at i-Open Technologies? I’m the Marketing & Communications Assitant at i-Open! How long have you been with the i-Open Group? I’ve been with the i-Open Group for almost 2 years! One of the most challenging parts of my role is applying my business and marketing knowledge to the complex products that i-Open develops. My past work experience and education have not been very technical in terms of programming and software solutions so it is a constant challenge wrapping my head around the new features and products our team is developing. The most rewarding part of my role ties into the most challenging part. I find myself greatly driven by the intrinsic rewards that my job offers. Working for the i-Open group of companies allows me to learn new skills on a daily basis and provides me with opportunities to apply that knowledge. The most rewarding part of my role is learning something new, usually on the technical side of things, and finding a way to apply that to whatever marketing or communication task I am currently working on. Where are you from and how long have you lived in the Fraser Valley? I’m from Mission and have lived there for 24 years. How did you hear about i-Open Technologies? I used to work as a Manager at a restaurant here in Mission and Raymond Szabada, CEO of i-Open Technologies, came in for dinner during a slow period so I began chatting with him and learned about his journey as a tech entrepreneur and learned the basics of what i-Open does. 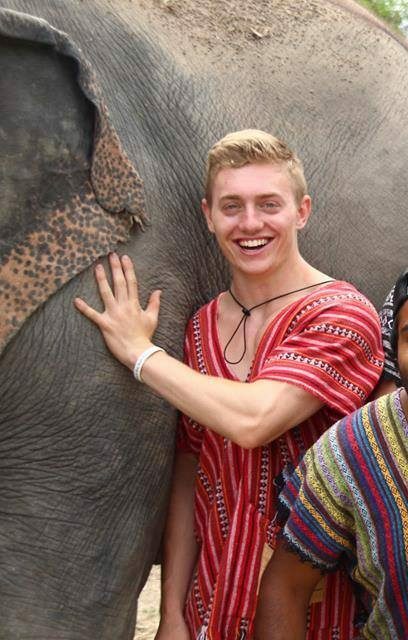 Erik was clearly enjoying his time at the Elephant Sanctuary in Thailand back in 2016. I have a long list of interests but I think my favorite activity to do outside of work would be something related to sports and fitness. I have been an athlete since a very young age and there is nothing I look forward to more than exercising, whether it be at the gym, playing football, playing soccer or any other form of exercise… I love it all. Something I love equally as much as exercise is traveling. Over the past 5 years, I have spent time backpacking in Thailand, Eastern Europe, and Scandinavia. These experiences have been extremely rewarding and I already cannot wait to explore more of the world! One of the numerous embarrassing things that have happened to me would be back in grade 5, I had a presentation (don’t remember what it was about) and I decided it would be cool to rap the entire presentation to my class. At the time I’m sure it wasn’t that bad but looking back… definitely embarrassing. Where do you volunteer or give back to the community? I volunteered at the Mission Folk Music Festival for 4 years. I like to contribute in small ways. For example, when I am out running, I often pick up garbage or last winter I donated old blankets from my house to homeless around Mission. I played the violin for 8 years when I was younger. Give someone you work with a shout out and explain why. Shoutout goes to Ashley Mackinnon. Aside from her doing her job flawlessly, she does a lot of little things that can go unnoticed such as keeping the office clean and organized, ensuring there is always coffee to keep the team happy and focused, and keeping the office plants alive and healthy… usually :).